Fatima Bhutto’s mesmerising and impassioned debut novel The Shadow of the Crescent Moon focuses on the impossible but urgent choices facing five young people living in the tribal areas on the Pakistan border with Afghanistan, where communities are under constant threat from brutal Taliban foot soldiers and American drone strikes – and the vagaries of the Pakistani administration. As the events of a single morning unfold, we observe and inhabit the conflicting minds of three brothers and the two women who mean most to them as they face up to impending horror and devastation. She answers some quickfire questions while on the London leg of her book tour. Why did you choose fiction to explore the realities of personal freedoms and family and community ties in this region? Magnificent nature offers a timeless backdrop to the human failures, frailties and atrocities you depict. How much time did you spend in the north specifically to research this book, its settings and its principal characters? The novel is narrated in a neutral, observational tone, which captures the inevitability of the unfolding drama, and the helplessness of those involved, yet intensifies the horror for the reader. Did you find that a certain level of detachment was a requirement of the story? Samarra is a passionate, principled, fiery and determined woman who is unafraid to make trouble in support of a just cause. How closely do you identify with her above the other characters? Which writers do you most admire, and who has influenced your work? Which other writers in Pakistan and across the subcontinent should make English-language publishers sit up and take notice? Fatima Bhutto was born in 1982 in Kabul, grew up in Damascus, studied in New York and London and lives in Karachi. She is the daughter of Mir Murtaza Bhutto, a prominent politician who was shot dead by police in 1996 three years after the family’s return to Pakistan from exile, and the granddaughter and niece of executed and assassinated former Pakistan premiers Zulfikar Ali Bhutto and Benazir Bhutto. 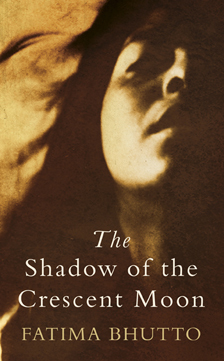 The Shadow of the Crescent Moon is published in hardback by Viking and as a Penguin eBook. Her previous book, Songs of Blood and Sword: A Daughter’s Memoir, is published by Vintage.